By now you’ve probably seen, or at least heard about, the new “My Plate” icon. If you’ve taken a moment to click over to the USDA’s ChooseMyPlate.gov website, you’ve also seen that they have seven key takeaways as part of the 2010 Dietary Guidelines (sadly, only one of which is actually conveyed by the icon), along with lots of explanatory information about the icon and the Guidelines. The icon is, by intent, incredibly simplistic. I’m actually a fan overall, since it distills everything down to the essences (and as I’ve said before, I love that it’s a plate, not a pyramid). So the website is needed to back up the icon with supporting information and (mostly good) advice. But what if you’re in your kitchen, not at your desk? How do you know if your meal is going to stack up? Simple! Just print out this free Guide to the My Plate Icon, and post it on your fridge for the whole family to see. Do it. Do it now! If you’d like to share this guide on your own website or blog, please be respectful (and law-abiding) and share it by linking directly to this post. Please do not link directly to the PDF or copy the PDF to your own server. Thanks! love love LOVE this. Great summary and who doesn’t love a cheat sheet??? i do like that they say “Protein” and not “Meat”…(not just b/c I’m vegetarian) it broadens that group. And i am a fan of “rainbow” foods. Glad you mentioned that. Thanks! Thanks, Amee! Glad you like it. Excellant. I wonder is there’s an app yet. That would be handy when you’re out and about. Really fantastic, Andrew! Really nothing to add to your excellent work. Despite obvious bowing to various Big Food lobbies (and other widely-covered shortcomings), I do feel like the plate is a huge improvement since a mountain-like pyramid of food was just ridiculous! 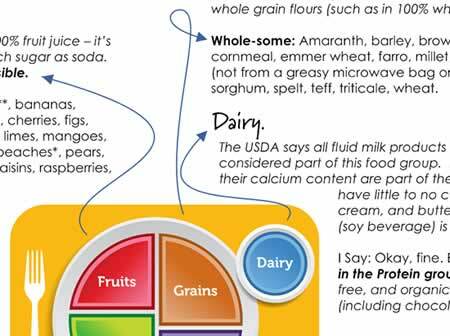 I generally think that I’m past the USDA needing to tell me how to eat (shudder shudder), but I think this is a useful visual for those that are just learning about eating well. Thanks! The problem with “Population-Based Recommendations” is that they have to cater to, well, everyone… Which doesn’t leave much room to accommodate individual needs. But yes, I think the plate (and accompanying website/info) is a good starting point. Andrew, I’m glad to hear your perspective on this, because I like the new structure, too, in many ways. It takes away the rigidity of the pyramid, which seemed to imply that if you weren’t following it by number of things eaten, you weren’t going to be a healthy person. My Plate allows for different lifestyles and cultures to apply it for healthful living, and gives everyone control over the answer, within a certain set of guidelines. You’re absolutely right. This new icon allows for flexibility. I do wonder, though, if it’s too flexible? Will people eat un-healthfully while thinking they’re eating well?